Potential additional funding is available for the $1.6 billion train hall planned for the James A. Farley building, but the fate of the financing’s source remains up in the air. The Post Office On Eighth Avenue has 1.5 million square feet of air rights that were not part of the deal reached between the state and the development team tapped to transform the building (Vornado Realty Trust, Related Companies and Skanska). State officials said on Friday that the financing of the train hall doesn’t depend on any air rights sales. But on Monday New York senior Sen. Chuck Schumer mentioned the development rights alongside the “good chunk of federal funding” that is expected for the project. “There will be private dollars. The air rights are going to bring in a whole lot of money,” Schumer said during a press conference at the newly opened West End Concourse. He didn’t specify the amount expected, but previous estimates place the value of the air rights between $450 million and $500 million. In 2016, developers paid $292 per square foot on average for rights in Manhattan, according to TenantWise. A 2005 version of the plan for Farley, known then as Moynihan Train Station, actually transferred a majority of The Air Rights Across The Street from the post office — where a Duane Reade now stands — for a residential building. That arrangement ultimately fell through. Vornado, which owns 8 million square feet of office space in the area surrounding Penn Station, seems like a potential buyer for the air rights that can be transferred to an adjacent site. Representatives for the company declined to comment. Gov. Andrew Cuomo’s office directed questions about the air rights to the Empire State Development Corporation, which could not immediately comment. 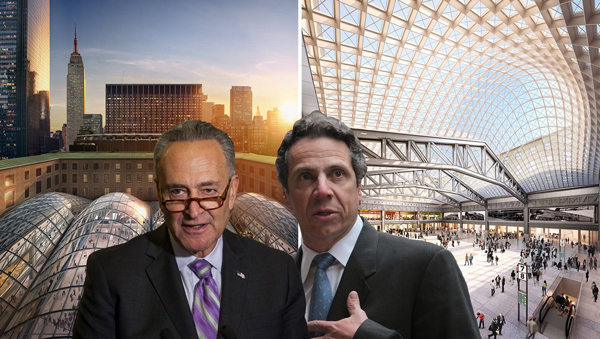 Last week, Cuomo and other state officials announced that they’d finalized a deal to build the Moynihan Train Hall, which will include 700,000 square feet of office and retail space and a 255,000-square-foot train hall. Under the financial agreement, the state will contribute $550 million, the developers will pay $630 million and $420 million from Amtrak, the MTA and other federal sources. Monday’s press conference focused on the opening of the extended West End Concourse, which opened last week and creates additional access to The Long Island Rail Road and Amtrak tracks. 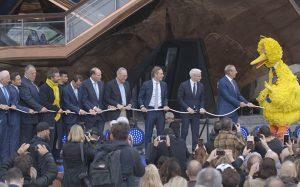 The concourse, Cuomo touted, means LIRR customers never have to go into Penn Station again. The concourse is the first phase of the Moynihan Train Hall, which was first proposed by the late Sen. Daniel Moynihan more than two decades ago. Schumer credited Cuomo with getting the project underway after other governors failed to do so. During Monday’s event, the governor also stressed the need for the Gateway Tunnel project and reiterated his desire to combine the $20 billion project with the redevelopment of Penn Station. Last month he launched a task force to study options for transferring control of the station from Amtrak to either the state, a private company or the Port Authority of New York and New Jersey. “A train hall is only as good as its tracks, and we can’t continue to have Penn and Amtrak continue to run those tracks the way they are now,” Cuomo said. The governor also noted that the current tunnels between New York and New Jersey are “in such a state of disrepair” that he’s uncertain they will remain functional while Gateway Tunnel is being built, which is expected to take 10 years. “We need it desperately. And we can’t talk about this for five years or six years or seven years because, literally, we don’t have time,” he said. Schumer lamented the funding cuts proposed in President Trump’s budget, which include financing key to the tunnel. He noted that the federal government paid for $250 million worth of the $320 million earmarked.